The District Assembly will be held at the Cameron YMCA in Cameron Missouri on April 27th. I love the District Assembly for many reasons and have attached the days agenda. My passion in life has always been kids and literacy. On this day, we will honor two winners of the Teacher of the Year Awards by presenting two lucky teachers with a check for $1,000 each! We will also be privileged to hear the three finalist of the District’s 4-Way Speech Contest. These finalist will receive $1,000 for first place, $500 for second and $250 for third. I am always amazed by the talented young people we have in our district. Our outbound Group Study Exchange team has now been in Australia for a little over two weeks. Please check out the Facebook pages to see their exciting adventures. The inbound team will arrive this Saturday. Feel free to come and greet our team at either American Airlines at 3:23 p.m. on March 30th as they arrive or join us at the Embassy Suites by the airport around 4:00 for a celebratory toast and official welcome to District 6040. I look forward to seeing the Australian team around our district during the month of April. If you don’t get a chance to see them in your community, please join us at the District Assembly where you can see both teams make a presentation. The annual Shoes for Orphans Soul drive is now underway and the caravan schedule has been prepared and is attached. Our very own Larry Lunsford will be on hand to end the day with his annual Shoes for Orphans Soul Roll Call of clubs. It is always amazing to see the generosity and love clubs have for this District Project! You won’t want to miss this day. It is FREE and we FEED you lunch! What could be better than that! The day is very casual and jeans are suggested. Be comfortable and come out and join us for an exciting day of Rotary Fun! Please sign up on the following link so we can make sure we have plenty of food and drink on hand for the REAL MCCOY’S last hurrah. John Gill has been tirelessly organizing sand bagging operations all over north Missouri to save Missouri farms and towns. 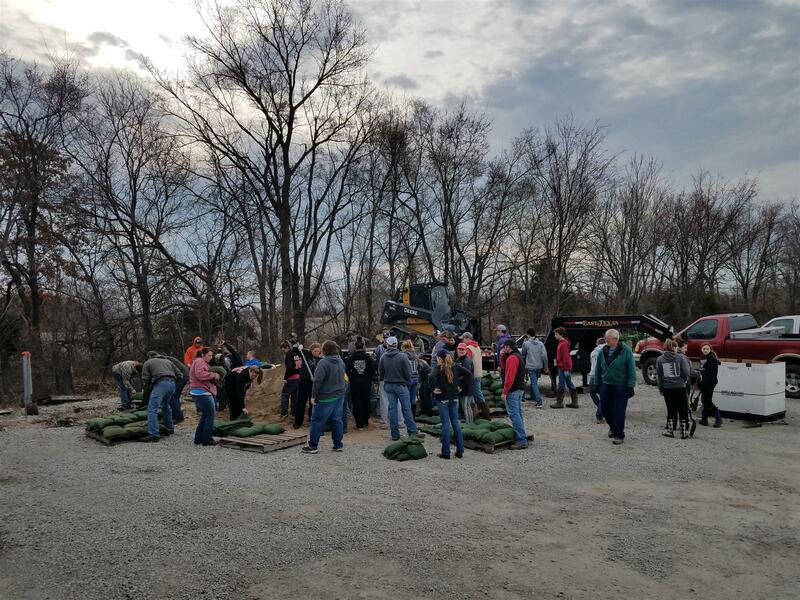 For example, Monday March 25 saw 500 volunteers in Norborne, MO. Those individuals sand bagged 10,000 sand bags per hour. The water was running two feet over the levee and those volunteers saved that town by shoring up a two mile stretch of levee. The Red Cross was on hand and could not keep up with the food and water needed. John said the Red Cross showed up with toothbrushes and toothpaste about midnight and it was a wonderful gift. John told me he is sleeping about 2 hours per night…he is a Rotarian in Action! He exemplifies the ideals of Service Above Self. Thanks John for all you do! As part of the Reach Out and Reach Challenge, members from the Waldo-Brookside Rotary Club spent over 4 hours reading to students at John T. Hartman and Lee A. Tolbert schools. The students had the chance to pick what book was read to them. Scotland County Rotary celebrated their 40 Anniversary in Rotary on March 19th, 2019. 17 of 40 Past Presidents were on hand for the evening. Past Rotary International President, Ray Klinginsmith, was the featured speaker and entertained the crowd with his humor, wit and insight into Scotland County Rotary. Ray also presented plaques to charter members John Cook and Dr. Harlo Donelson and multiple Paul Harris pins to both Diana and George Koontz. Lastly, new member Lisa Doster was inducted into Scotland County Rotary by District Governor, Julie McCoy. Congratulations Scotland County Rotary on 40 years of Service. It is shoes season. We are four weeks away from this year’s Shoes Caravan (Weds. April 24- Sat. April 27). The theme for our clubs this year is to collect shoes “at an all-time high collections pace”. So many orphan children are counting on our help. A pair of shoes makes the children feel valued. It was a resounding consensus at our fall 2018 District Conference to send our shoes this year to KENYA, along with some distribution in the UNITED STATES. Buy now, join the caravan later and meet us at the District Assembly in Cameron on April 27th, 2019 for our Annual Shoes Recall. The Power of Giving! The Power of Rotary! What started as an auction item for one last lei left on the podium at the end of Show Me Rotary, ended up as a huge gift to The Rotary Foundation and our Polio Plus eradication efforts. Two people were bidding on the lei, then two tables and then random people from all over the ballroom at the Capitol Plaza Hotel started coming forward to donate money to Polio Plus. Many of those donating money were from District 6040. Our District 6040 has accepted the RI District 2241 (2241 includes Romania and Moldova) invitation to visit their district on the dates they proposed: the first day to be Sunday, 29 of September 2019, and the ending day to be 11 of October 2019, on Friday morning. Our District 6040 team will be in Romania/Moldova for 12 nights divided into three locations, with four nights in every area. We will stay in the homes of Romanian Rotarians while visiting their District 2241. Our Rotary District 6040 Friendship Exchange Team will consist of twelve persons (six couples). They request only couples, not single persons, as the makeup of our team going to Romania/Moldova. In March, five more District 6040 Rotarians joined the ranks of Rotary Leadership Institute graduates, bringing to 71 the number of D 6040 Rotarians to have graduated from the premier Rotary leadership program. They are (L-R) Frank Grimshaw (Macon County), Kurt Hueschen and Dan Ryan (Waldo-Brookside), Janet Gremaud (Kirksville Thousand Hills), and Penny Donnelly (Blue Springs). Members of 24 different Rotary clubs have graduated from the three-day course since it was started here in 2014. Dear Women in Rotary: My fellow District Governors in Missouri: Jayne Lowe (6110), Linda Puchbauer (6060) and Susan Haralson (6080) and I are hosting the first ever “Power of Women in Rotary Conference.” It will be held in Jefferson City on May 11th from 11-4. The cost is only $25 and includes your lunch for the day. We have filled the day with an action packed list of powerful women speakers. Cyclone Idai ripped through Southern Africa and millions have been affected in Mozambique, Malawi and Zimbabwe after what the UN says could be the worst natural disaster ever to hit the southern hemisphere. Floods have affected almost 1 million Malawians and forced at least 125,000 from their homes and sadly these numbers continue to rise. District 6040 has multiple projects in Malawi. ShelterBox is determined to reach as many families as possible. ShelterBox has a team en route to Malawi to assess damage to homes and to coordinate support for families to recover as the floodwaters recede. Have you ever wanted to travel to the Dominican Republic? Plans are underway now for the Districts 6040-4060 Group Study Exchange in 2020. GSE provides travel grants for teams to exchange visits in paired areas of different countries. Teams are comprised of four team members who may be Rotarians or non-Rotarians. All team members must commit to assist in humanitarian service projects upon completion of the GSE experience. The team leader is a Rotarian. For three to four weeks, team members observe and participate in the Rotary District and Club humanitarian service projects and observe how their vocations are practiced abroad. They develop personal and professional relationships, and exchange ideas. The teams are home hosted for lodging and meals and group travel within the host country. District 6040 pays for round-trip airfare to the host country.